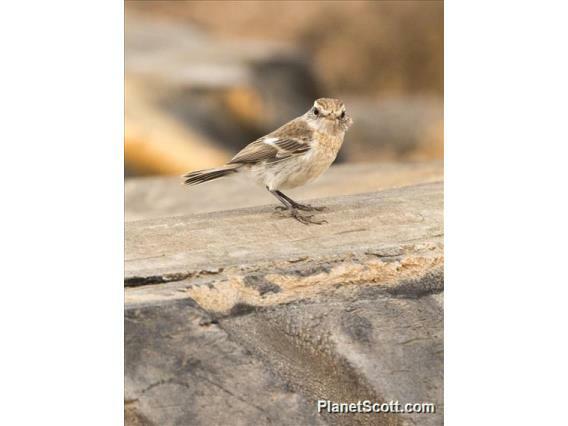 Saxicola dacotiae is endemic to the Canary Islands, Spain, where it breeds only on Fuerteventura (with occasional records from southern Lanzarote) (Martín and Lorenzo 2001). The subspecies murielae formerly occurred on the islands of Alegranza (where it was fairly common) and Montaña Clara, but these it went extinct in the first half of the 20th century due to a combination of natural factors and predation by introduced mammals (Bibby and Hill 1987, Martín and Lorenzo 2001, Illera et al. 2006). Its population was estimated at 650-850 breeding pairs in 1985 (Bibby and Hill 1987). More recent observations indicate that the current figure may be higher, but this almost certainly reflects differing survey methods, rather than a real increase in numbers. The extrapolation of survey results obtained in 2005-2006 put the population at 14,436 individuals (95% CI: 13,376-15,492) (Seoane et al. 2010). Studies involving more recent fieldwork have provided much lower estimates of 1,035 individuals (95% CI: 832-1,287) (Garcia-del-Rey 2009), which may be an underestimate owing to the methods used (Seoane et al. 2010), and 550-950 pairs, which may have been affected by drought conditions during part of the study period (Nicolai 2010; B. Nicolai in litt. 2011). Further research, involving comprehensive fieldwork, is required in order to obtain a more accurate population estimate. Optimal habitat continues to be impacted by rapid development for tourism, although its rate may have decreased in recent years, and it is likely that the population has declined since 1985, and continues to do so as predation by introduced mammals and excessive grazing continues and increases (Illera 2004; A. Iñigo in litt. 2011).